If I am the developer or owner of a shopping center, I am faced with a dilemma. What do I do about parking minimums? Of course, many municipalities are considering this issue. Recently, Buffalo became the first American city to eliminate parking minimums. Other cities are moving toward Form Based Codes, which can affect parking requirements. How do I plan for a future that may include the elimination or modification of parking minimums? What will my tenants’ customers do with their cars? Will I be able to lease space in my development without ample parking? Some argue that shoppers can use public transportation. I rode the Metro subway system in Washington D.C. for 10 years twice a day; in fact, I never drove to work during the business week. Yet I very seldom saw riders with shopping bags, and if they had been shopping, they might have one, usually small, bag—almost never two. If I’m doing serious shopping, I need my car. Surface lots are a big expense. I have to buy the land, grade and pave the lot, stripe and light the lot, remove snow, and provide security. Most municipalities now require landscaping, which I must maintain, and of course there is the problem of runoff, filling up local stormwater systems. This article illustrates all of the problems with parking minimums. Combine all this with the unknown impact of autonomous vehicles and the rapid advance of other parking and transportation technologies, and if I’m a developer or owner, I’m not sure exactly what to do. 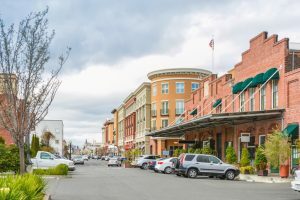 Perhaps a joint task force of IPI, the Urban Land Institute (ULI), and the International Council of Shopping Centers (ICSC) might be a place to start. What do you think? Many parking structures are dark, dull, dirty and dangerous, especially in large urban areas. Do they have to be? Why not think outside the box and improve the aesthetics with more (LED) lighting, colors, decorations and even ‘pocket retail’ outlets for coffee, newspapers, sundries that would improve safety through the security of human presence in what might otherwise be lonely and dangerous? Hey David, I think your joint task force is a great idea.